Here’s a guide on how you can enable iOS 10 iMessage effects in Messages app with Reduce Motion feature turned on at the same time. With iOS 10 now running on approximately 60-percent of compatible devices, and receiving positive reviews from device owners and critics alike, it’s probably fair to say that it’s been an unmitigated success for Apple, albeit not without its teething problems or issues. Amongst other things, Apple bundled in fantastic new messaging effects with the launch of iOS 10, which enabled users to communicate with full-screen bubble or confetti, or even invisible ink messages that appear when swiped. Following the update, users found that those effects wouldn’t actually play with a received message under certain circumstances, with it quickly being identified that having Reduce Motion switched on via Apple’s Accessibility settings was the root cause of that. It was kind of annoying that users were unable to invoke a battery-saving feature unless they compromised on the fantastic iMessage effects. Luckily Apple caught up to that inconvenience quickly, and has now addressed that in iOS 10.1. Apple has added an additional toggle that allows users to bypass the system-wide Reduce Motion feature, and ensure that effects are still honored. Step 1: As is usually the case with these types of things, we’re going to need to start our journey in Apple’s native Settings.app on the iOS device in question. 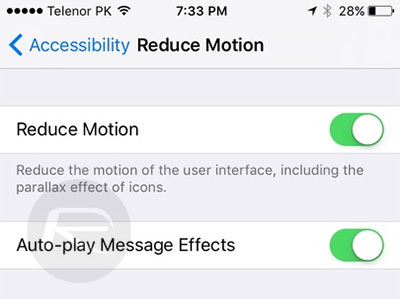 Step 2: In Settings, head to Accessibility > Reduce Motion. You must be running iOS 10.1 to be able to achieve what we’re trying to do here. Step 3: In the first instance, slide the toggle associated with Reduce Motion to the On position. 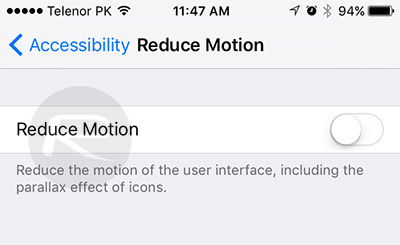 Turning Reduce Motion on means that various animations through the iOS system will essentially be bypassed in order to minimize the effect that they may have on individuals with motion sickness and the like. But in iOS 10.1, this will now produce a new preference called Auto-play Message Effects to be displayed. Step 4: Simply turn the toggle beside Auto-play Message Effects to the On position. This now means that Reduce Motion has effectively been negated even though it’s turned on, but only for bubble and message effects within the iOS 10.1 Messages app. 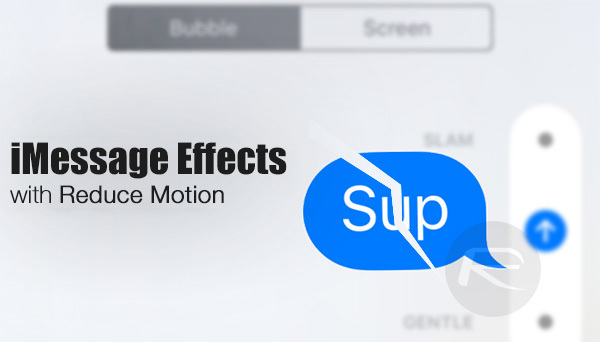 Following the above steps will enable the majority of motion animations within iOS, including the parallax effects of icons as Apple likes to remind us, to be reduced enough to not cause any detriment to those who may be affected by that type of activity, but will also ensure that those stunning and fun new full-screen effects and animations will still occur in the Messages app. Well I found it helpful, so thanks!